Hugo Boss has come out with a new cologne and they are giving out samples of it for everyone to try. 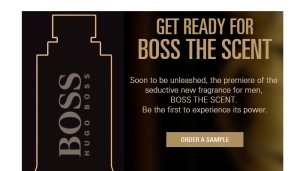 Get yourself or someone in your house these free Boss the Scent samples before you can even get it in store. Hugo Boss is known for their high end clothing, accessories and colognes. Everything they do is to a very high level and this scent is sure to impress. Perfumes and colognes are tough to determine if you like it, until you have it on for a day. This is a great way to see if you are a fan of the latest scent from Hugo Boss.